What does an innovation agenda look like in a Measure M world? With the passage of Measure M, Los Angeles County made a bold choice for the future of transportation in the region. In the coming decades, Metro and our partners will build out our transportation network, vastly improving its capacity and capability. The biggest infrastructure build-out in North America will undoubtedly be a game-changer. Delivering major infrastructure projects is a complicated and challenging task. The good news is that there are many innovative project delivery strategies being used around the world in places like Canada, Australia and much of Europe. These countries have found that bringing in a single firm to deliver a project from soup to nuts – with appropriate accountability for results – can result in a project that is delivered faster, better and cheaper. Metro’s Unsolicited Proposal Policy was created to allow these firms to bring us ideas for how to achieve this. Metro has already received eight proposals for such project innovations, and advanced the first of them to a second phase of detailed review. Not all projects are suitable for this delivery method. In fact it is likely that most Measure M projects will be delivered through traditional mechanisms. But if innovative delivery mechanisms are not considered, we could be missing a major opportunity to accelerate or improve project delivery in an area where improvements are needed ASAP. There is much excitement about the new projects that will come on line under Measure M. However, often overlooked is the fact that Measure M dedicates $22.5 billion to transportation improvements in cities around L.A. County and $31.3 billion to operations and state of good repair. 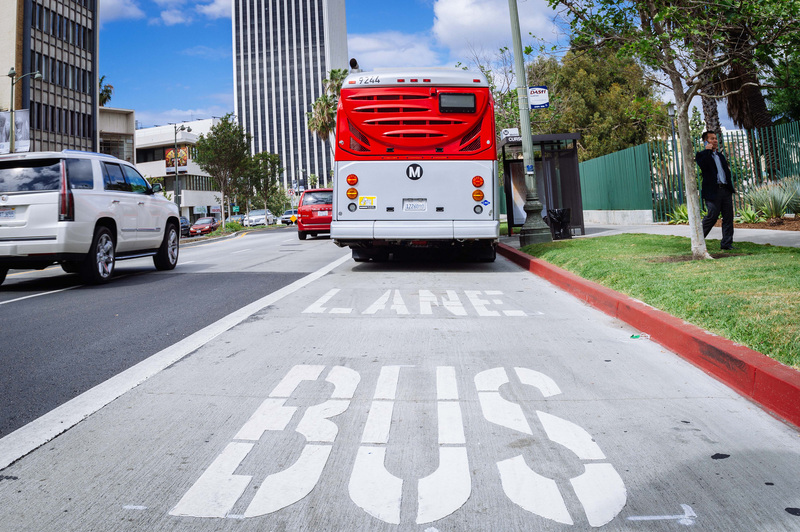 One of the few bus lanes in our region is on parts of Wilshire Boulevard in the city of L.A. Photo: Metro. While it is tempting to focus on the new services, perhaps even more critical is improving the service we already provide. For example, the vast majority of our riders are on buses, which is likely to be the case for many years to come. And yet most of our buses sit in traffic, stalled like any other vehicle in the County. If your goal is carrying large numbers of people, this makes no sense. We need to work with local officials to give buses greater priority and, in some cases, their own lanes, to improve the reliability and convenience of the service. This is a tremendous challenge, and will require innovative policy approaches and project designs to deliver in a way that works for everyone. Similarly, we need to ensure that Metro is providing services that offer real travel benefits. No one likes to wait, and transit is only valuable if it is running frequently enough to minimize waiting time. People do not have to wait for long when they drive their own vehicle, ride their own bike, take a shared bike, hail an Uber or Lyft, or walk. Yet we expect them to tolerate waiting, sometimes 20, 30, or even 60 minutes, for a transit ride. Investing in frequencies sufficient to offer people a ride when they need it will be a critical component in the success of the promise of Measure M.
It seems that there is an app for everything these days, and the world is exploding with new mobility options that take advantage of emerging technologies to provide people with travel options. Yet Metro still offers the majority of our service on traditional forms of transit, such as trains and buses with fixed routes and schedules. Fixed route transit will certainly continue to provide the core of our service, but Metro now has access to all sorts of new options for providing transit options that can offer what buses and trains don’t: demand response with variable routes. Whether we’re trying to serve larger areas with spread out destinations or provide faster access to and from transit hubs, Metro will be experimenting with new service models to make sure that we’re using every tool available to help solve our mobility challenges. Transit in the U.S. is often treated as an option of last resort, rather than a critical part of a world-class urban center. People are offered a safe, clean ride for a low price, but not much else. This approach is a recipe for ensuring that transit will remain a last resort for most people. Measure M can only be successful if we provide customers with an experience that is not just “good enough” but strives to be competitive with other transportation options. For example, customers should have near-perfect real-time information about which bus or train to take, when it is coming, and how to complete their trip. They should have access to cellular and Wi-Fi throughout their journey so that they can remain in contact with the outside world. People should be able to pay for their journey across multiple modes and operators through whatever means is most convenient for them, including cash, credit cards, and mobile phones. Perhaps most importantly, customers must feel as safe and secure on the transit system as they would on any other mode. All of these outcomes will require innovation, but it’s worth keeping in mind that innovation isn’t always about a breakthrough technology. Innovation really just means doing something new because it works better, and technology is merely one tool for accomplishing that. Innovation is a mindset that Metro and our partners must adapt to find new ways to deliver projects, optimize existing services, expand our toolkit, and enhance our customers’ experiences. The success of Measure M depends on it. $1.6B in fed funding for subway extension! All of this is sounds great. LA County can use more bus lane only in more corridors specifically looking at Metro’s most productive existing Rapid Bus Lines as well as new BRTs. We really need continuous bus lane only lanes and not just segments of the corridor like we have on Wilshire Blvd. Also we should be able to use our cell phones to pay for our transit trips like we do at Starbucks (TAP on mobile devices). Currently Metro is maintaining overall budgeted revenue service hours. So basically when Metro improves specific bus line frequency those additional hours are taken from elsewhere in the system. Metro has largely ignored its Owl Network over the last 20 to 30 years. Running times are in adequate and some corridors are simply ignored. So Metro has lots of room to improve its transit system. All of this applies to other fixed route operators in the county. So Joshua (OEI) I challenge you and Metro to take this beyond lip service and start the process of implementing substantial improvements to Metro’s transit network that is safe, efficient, effective, and just overall better than what we have today. Would really like to see some focus on the system today while also planning for the future. Acceptance of fares by mobile phones is hindered right now only by the stubborness Metro has for turnstiles. Get rid of them and Metro can accept fares paid by phone, and save on the enormous cost to rent them. Take this money and hire the security staffing that the system greatly needs now to prevent more ridership loss. And expand all-bus door boarding to all Rapid Bus Lines, not just Route 910/950. Lastly please make sure that information screens are up to date, we can’t all keep looking at Twitter to check how service really is running. These are all essential points. Hopefully they will become reality very soon. As many have mentioned, the current state of the bus system is mediocre at best with frequencies often at a level that is utterly perplexing. Too many unprotected grade crossings/street-running sections also are a huge problem on metro light rail where the train often functions like a glorified bus, stopping at red signals multiple times between stations, sometimes for an entire minute. Gold line east-side, blue line in long beach, and expo phase one are easily the worst offenders.